Gene Link presents various design options for synthesizing effective oligo and probes based on the application. Smart oligo and probes can be synthesized in a predetermined way to exhibit the features that is desired; for instance to increase cellular delivery we may add cholesterol to the synthetic oligonucleotide sequence or for nuclease resistance convert the phosphodiester linkages to phosphorothioate as is commonly used for antisense oligonucleotides (ODN&apos;s) or to add a short peptide sequence that is known to aid in transport of aptamers to the nucleus. The premise of this product profile is to go beyond the standard DNA and RNA bases for constructing synthetic primers, oligos and probes and to develop a cross-disciplinary synergy of molecular applications to a wealth of nucleic acid chemistry tools available as modified bases. Synthetic oligos are used ubiquitously for molecular applications from the simplest as amplification primers to the more complex as siRNA and aptamers. In general a well designed oligo to serve as a primer, probe or siRNA will perform using standard bases for hybridization to its cognate sequence(s); but we can make it perform better using modified bases that are specifically developed by nucleic acid chemists to enhance particular characteristics. As with most natural molecules oligos are prone to degradation under normal conditions, specifically once introduced in body fluids. Ubiquitous nucleases well as chemical instability lead to fast degradation with a finite half life. The premise of this product guide is to discuss various modifications that are offered by Gene Link that may be used for oligo modification to enhance specific properties based on the application. 1. Increased duplex stability and manipulation of duplex stability. Careful selection of modifications and verifying their performance is required; the guidelines presented are based on documented physical and chemical properties of the modifications. Design rules may have to be established empirically for very specific or novel assay settings, but following the recommendations will provide a good start. 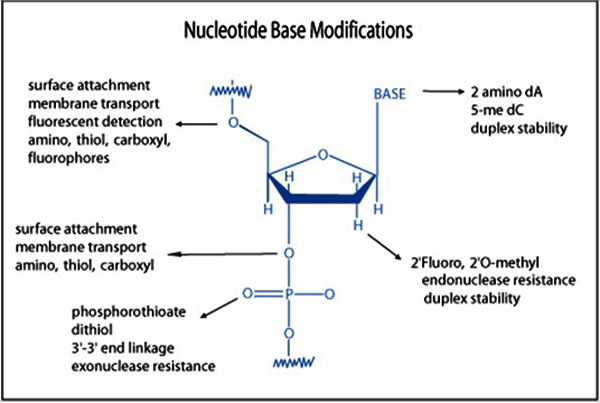 A partial list of possible modifications to a nucleotide. Specific and stable hybridization of the oligo to its cognate sequence is the desired outcome of a successful experimental protocol. The melting temperature of the oligo dictates the strength of the affinity and thus the stability of the hybridization. Manipulation of the oligo sequence to increase the duplex stability or in some cases to decrease the duplex stability in certain loop structure will lead to oligos with increased affinity for the target molecule. There are many nucleic acid modifiers that increase duplex stability, examples are 5-methyl dC, 2-amino dA, locked nucleic acids etc. summary is presented in the table below. Gene Link does not presently offer LNA substituted oligo synthesis due to licensing issues and as such LNA base modifications are not included in this guide. As with most natural molecules synthetic DNA and RNA oligos are prone to degradation under normal conditions, specifically once introduced in body fluids. Ubiquitous nucleases as well as chemical instability lead to fast degradation with a finite half life. Nucleic acids are degraded rapidly once introduced in bodily fluids, RNA are more susceptible to degradation under normal laboratory conditions particularly due to RNase contamination. Special precautions must be taken to prevent RNA degradation. Nuclease resistant modifications can be introduced chemically in oligonucleotides that still retain its molecular structure and its shape based molecular interaction. These modifications are almost indispensable and have been used intensely in antisense applications. Also nucleic acids with mirror image chemistry have been developed that evade natural nucleases completely. Examples are converting the normal phosphodiester linkages to phosphorothioate or phosphorodithioate linkages, 2’O methyl, propyne bases etc. Antisense oligonucleotides refer to short, synthetic oligonucleotide that are complementary in sequence and upon specific hybridization to its cognate gene product induces inhibition of gene expression. Oligonucleotides, as short as 15 mer have the required specificity to inhibit gene expression of a particular gene by annealing to the cellular mRNA (1,2). The mechanism of gene expression inhibition is based on two properties; the first is the physical blocking of the translation process by the presence of the short double stranded region, secondly the presence of the RNA-DNA duplex is susceptible to cellular RNase H activity. RNase H cleaves the RNA-DNA duplex region of the mRNA thus preventing the faithful translation of the mRNA (3). The stability of the RNA-DNA duplex in terms of hybridization and half-life is crucial to successful gene inhibition. Vigorous research activity in the area of nucleic acid chemistry has been devoted in developing novel base analogs that are resistant to degradation and that possess strong hybridization properties. This product profile aims at listing some analogs that meet the above criteria and are amenable to be synthesized by currently available standard DNA synthesis chemistry. This includes the classical phosphorothioate linkages (4), propyne analogs (5) and 2’Fluoro bases. Gene Link offers an extensive array of modifications to accomplish duplex stability and nuclease resistance to synthetic oligos. We have the ability to synthesize complex combinations of modifications, chimeric oligos and fluorescent probes. In addition to the synthesis of these modified oligos, we routinely assist customers in the design of the oligos that are particularly suited to their application. Using these base substitutions, duplex stability and therefore melting temperatures are raised by the approximate amounts shown below. 1. B.S. Sproat, A.I. Lamond, B. Beijer, P. Neuner, and U. Ryder, Nucleic Acids Res., 1989, 17, 3373. 2. T. Imanishi, and S. Obika, Chem Commun (Camb), 2002, 1653-1659. 3. S. Obika, Y. Hari, M. Sekiguchi, and T. Imanishi, Angew Chem Int Ed, 2001, 40, 2079-2081. 4. A.A. Koshkin, et al., Tetrahedron, 1998, 54, 3607-3630. 5. M. Petersen, and J. Wengel, Trends Biotechnol, 2003, 21, 74-81. 6. A. Sabahi, J. Guidry, G.B. Inamati, M. Manoharan, and P. Wittung-Stafshede, Nucleic Acids Res., 2001, 29, 2163-2170. 7. T. Ono, M. Scalf, and L.M. Smith, Nucleic Acids Res., 1997, 25, 4581-4588. 8. P. Muhonen, et al., Chemistry & Biodiversity, 2007, 4, 858-873. 9. W. Guschlbauer, and K. Jankowski, Nucleic Acids Res., 1980, 8, 1421-1433. 10. K.R. Julien, M. Sumita, P.-H. Chen, I.A. Laird-Offringa, and C.G. Hoogstraten, RNA, 2008, 14, 1632-1643. 11. A.M. Kawasaki, et al., Journal of Medicinal Chemistry, 1993, 36, 831-841. 12. S.K. Alahari, et al., J Pharmacol Exp Ther, 1998, 286, 419-428. 13. D.R. Corey, J Clin Invest., 2007, 117, 3615-3622. 14. C.R. Allerson, et al., Journal of Medicinal Chemistry, 2005, 48, 901-904. 15. A.D. Keefe, and S.T. Cload, Current Opinion in Chemical Biology, 2008, 12, 448-456. 16. S. Davis, et al., Nucleic Acids Res., 2009, 37, 70-77.